Fulling, or milling, is a finish that produces a wool fabric softer, denser, heavier, and thicker than greige goods (fabric from the loom). Wool greige goods are reedy (loosely woven). Because fulled fabric is more compact, it has better cover and appearance. The fabric is shrunk under controlled conditions to make it compact. Shrinkage may be by as much as 50 percent, and it must be controlled or the fabric will become hard and harsh. Almost all wool woven fabric will be fulled to some degree; many knit fabrics will also be fulled. The amount of fulling will depend on the characteristics of the finished fabric. Woolen fabrics, made from yarns with fibers that have been only carded are often heavily fulled. Carding and combing are yarn processes. Carding aligns the fibers somewhat where combing further aligns the fibers before spinning. Combed yarns have longer staple fibers and fewer fiber ends than carded yarns. Melton cloth is an example of fabric of such considerable fulling as to have a feltlike texture. Melton cloth is so heavily fulled that the warp and filling yarns are not seen. The fabric is smooth with a very short nap. Napping is a finishing process where the fiber ends are brushed to the surface of the fabric, producing a softer fabric. Melton and loden cloth are used for cold weather coating. Other fabrics that are heavily fulled are duffel-which is used in overcoats and blankets-kersey, and boiled wool. Boiled wool is not actually boiled but heavily fulled. Worsted fabrics, made from yarns in which the fibers have been carded and combed, are lightly fulled. Since worsteds are firmly woven, they tend not to shrink as easily as loosely woven fabrics. The fibers in worsteds are less mobile and thus are unable to interlock as easily as soft, fluffy fabrics. Knitted sweaters are also lightly fulled. The fulling process takes advantage of the microstructure of wool fabric. The outer layer of the wool fiber consists of overlocking scales that can be seen under a microscope. The scales on the surface of the fiber point toward the tip and will move only in one direction. In the presence of moisture, heat, and friction, these scales will open up, move, and become interlocked. Once these scales interlock, the change is permanent and the fabric shrinks and thus becomes more compact. The wool fabric is scoured to remove any processing oils that may be on the fabric. Then the fabric is placed in a rotary fulling or jig machine. The fabric is passed between stainless steel rollers pounded by clappers. Water with a mild alkaline soap and sodium carbonate or a weak acid dampens the fabric. Wool fibers need moisture, mechanical action, and heat for the scales on the fibers to interlock, and the friction from the pounding produces the necessary heat. The fabric is carefully dried after the fulling process. 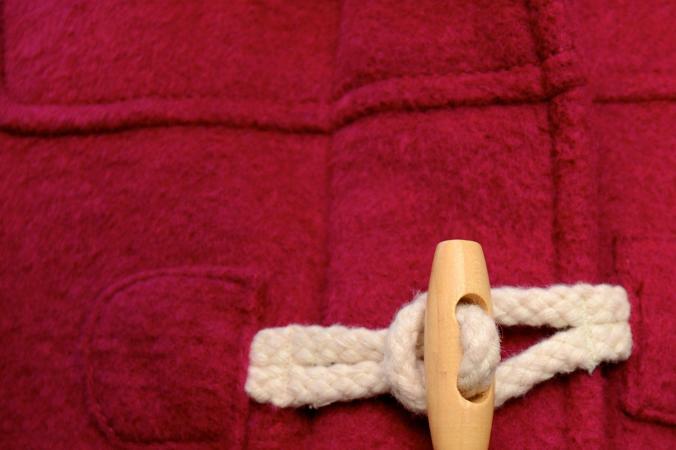 To give it additional softness, the fabric may be brushed or napped. Carty, Peter, and Michael S. Byrne. The Chemical and Mechanical Finishing of Textile Materials. Newcastle upon Tyne, U.K.: Newcastle upon Tyne Polytechnic Products, 1987.